Review: Everyone! You listening?!?! If you or any of your students are a fan of the Whatever After series, you need to get this for you/them. It is a perfect companion for them! But don’t think that this is just a duplicate of the series, it is similar yet also so different! First, Holden and Maddie already don’t work well together, so going into the fairy tale is not only about fixing the fairy tale but also about fixing their relationship. Second, the fracturing of fairy tales gets even more ridiculous than you can even imagine. Third, Holden and Maddie are in the fairy tales as characters, not as themselves. I will say that both this book and the Mlynowski series looks at the problems in fairy tales and how the stories could be better told to make everyone happy. Teachers’ Tools for Navigation: First and foremost, this book will be a hilarious read aloud and an independent reading books that will fall into so many hands. Additionally, in the backmatter of the book, the author includes a glossary including the harder vocabulary in the book, a think again section with three questions for readers to think about, and finally a section about how to write a ruined version of a favorite tale. All three of these activities help make the book even more useful in a classroom. Everyone has someone in their life like Holden, who’s unavoidable and hard to get along with. Who’s someone you’ve struggled to relate to, and what would you do if you had to work with him or her to “fix” a fairy tale? There are details about the wicked stepsisters that weren’t in the original tale, such as Beautianna’s desire to go to art school. Think of a supporting character from one of your favorite books whom you wish you knew more about. Come up with your own ideas for his or her character traits, wants, and needs. You can even try to write the whole story from that character’s perspective. 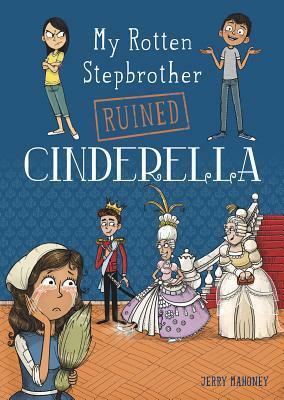 What do you think of the questions Holden raises about Cinderella? Do you think he makes some good points, or would you be as annoyed with him as Maddie was? Pick another story you know well and try to imagine what Holden’s problems with that story might be. Flagged Passages: “Maddie hadn’t seen her before, but she could tell this woman had plenty to be sad about, starting with her clothes. They were filthy, patched-up work clothes, and her hair was tied back with a rag. She sat in front of a pile of roses, and one by one, she plucked the thorns off each stem and placed them into a vase. Her hands were scratched and bruised from hours of performing this tedious, excruciating task. No wonder she was crying. ‘Do you need a tissue?’ Maddie asked her. ‘Tissue?’ the woman replied. ‘What’s a tissue?’ The woman turned her head and gazed at Maddie, confused. Of course, Maddie thought. They don’t have tissues in fairy tales. They weren’t invented yet. While she wondered how to explain this, she had another realization. This wasn’t any ordinary, sad woman. She was kind and familiar, the most beautiful woman Maddie had ever seen. She had bright blue eyes and, underneath the rag on her head, hair that seemed to be made from pure gold.